The inaugural Candy Store Cup took place over the weekend (July 29-31), with 12 modern and classic sailing yachts lining up in Newport, Rhode Island. Formerly known as the Newport Bucket, the relaunched regatta starred the 42 metre J-class yacht Ranger, the 52 metre Royal Huisman Meteor and the 65 metre schooner Adix (all pictured above). Charlie Dana, owner of Newport Shipyard who co-hosted the event with Bannister's Wharf, said: “There was an easy camaraderie in the air as sailors from around the world renewed old friendships, but the real story was the spectacle on the water. I was aboard schooner Meteor, agog much of the time at what was around us. It was a jaw-dropping sight. We're thrilled these yachts honoured us by participating." 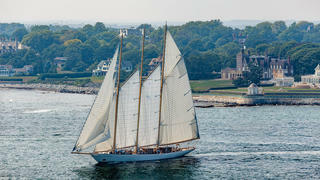 The inaugural Candy Store Cup took place over the weekend (July 29-31), with 12 modern and classic sailing yachts lining up in Newport, Rhode Island. 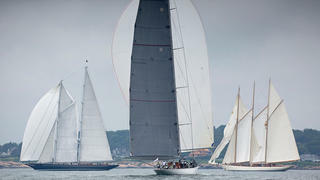 Formerly known as the Newport Bucket, the relaunched regatta starred the 42 metre J-class yacht Ranger, the 52 metre Royal HuismanMeteor and the 65 metre schooner Adix (all pictured above). Charlie Dana, owner of Newport Shipyard who co-hosted the event with Bannister's Wharf, said: “There was an easy camaraderie in the air as sailors from around the world renewed old friendships, but the real story was the spectacle on the water. 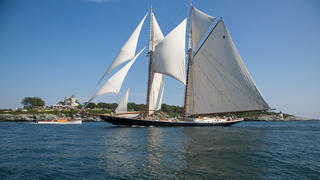 I was aboard schooner Meteor, agog much of the time at what was around us. It was a jaw-dropping sight. We're thrilled these yachts honoured us by participating." The racing was particularly tight at the inaugural Candy Store Cup, with Adix and Meteor tied on points in Class A. However, it was the former yacht (pictured above) that came out on top by virtue of having won more races over the course of the weekend. 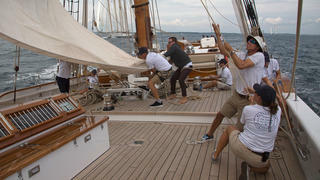 Class B was a more straightforward affair, with the 28 metre yawl Bequia the clear winner in this category. She also claimed the overall prize, the eponymous Candy Store Cup, which was filled with candy and champagne. 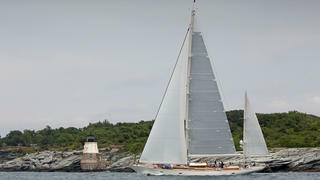 A veteran of the 2013 Loro Piana Superyacht Regatta, Bequia is seen here passing the Castle Hill lighthouse. The organisers of the Candy Store Cup opted for a compact three-minute staggered start, rather than the pursuit starts more frequently seen in superyacht racing. Tom Whidden, skipper of Bequia, praised this decision, saying: “It was the perfect regatta for this kind of racing, which allows owners and their crews that wouldn’t race otherwise — because of the nature of their boats — to have a regatta experience.” And the hard-working crew of Columbia (pictured above) certainly got into the regatta spirit. Despite the light to moderate air conditions, these classic superyachts were still able to show off their impressive rigs, with 43 metre schooner Columbia (pictured above) attracting plenty of admiring glances from nearby vessels.